« Tse & Tse Sale! I gave this recipe out a year or so ago on the site. But because it’s so easy to put together, I made it yet again last night, to have as a little nibble with some white wine before dinner. And we couldn’t eat it fast enough. (And almost didn’t have room for dinner.) It’s adapted from The Sweet Life in Paris. So for those of you who might have missed it, I’m bringing it up from the archives as you might want to make a batch for an upcoming get-together, too. 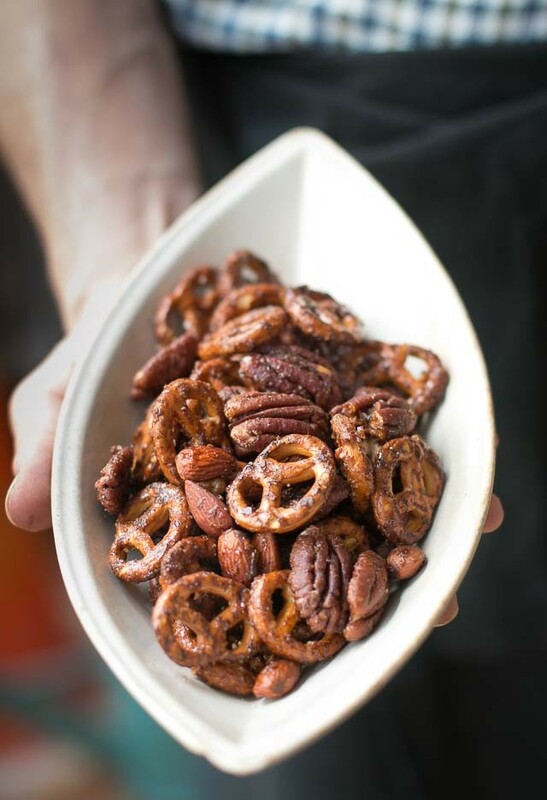 It’s really simple to make: all you really need is a bag of pretzels, a mixture of any kind of nuts that strikes your fancy, some spices, and a flurry of sea salt. 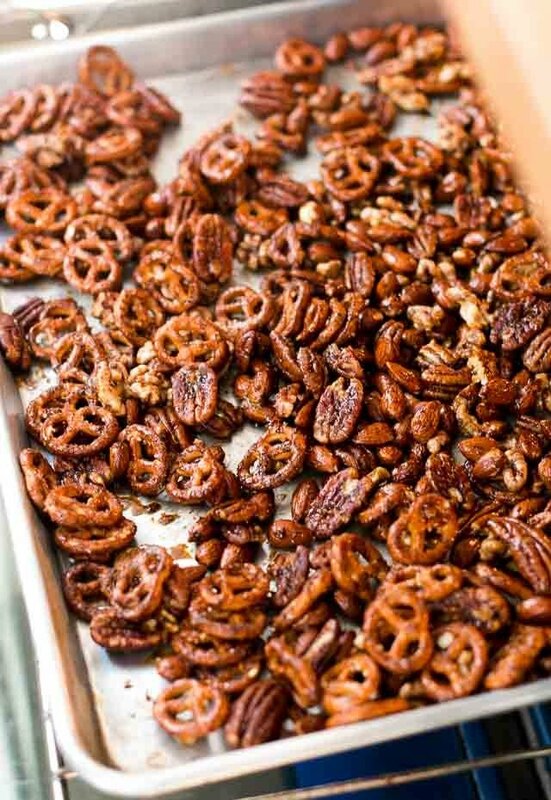 Add a restrained amount of melted butter and maple syrup, and when it comes out of the oven, you’ll barely be able to wait until the salty-sweet, spiced mixture of glazed nuts and pretzels is cooled down before diving right in. 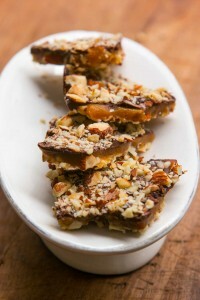 Adapted from The Sweet Life in Paris.You can use any mix of raw nuts that you want, but I’m pretty partial to some pecan halves tossed in the mix. With the bit of heat from the pepper powder, their toasty flavor provides exactly the right balance. I use a non-stick baking sheet which helps keeps the nuts form sticking during the second baking (step #4). But if you don’t have one, you can use a lightly-greased baking sheet (grease it after the nuts are toasted on it) or a silicone baking mat.Note that the salt is added after the nuts are stirred, so it doesn’t dissolve. And be sure to use flaky sea salt, which has a more delicate flavor than ordinary table salt. 1. Spread the nuts on a baking sheet and roast in a 350F (180C) oven for 10 minutes, stirring once for even toasting. 3. Add the warm nuts, and stir until the nuts are completely coated. Then stir in the salt. 4. Mix in the pretzels, then spread the mixture back on the baking sheet and return to the oven for 12-18 minutes, stirring a couple of time during cooking to make sure the brown sugar isn’t clumping. 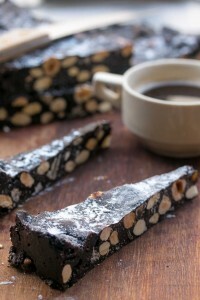 The exact baking time will vary, but the nuts are done when they are nice and toasty, and the mixture is nicely glazed. 5. Remove from oven and cool completely, separating the nuts and pretzels as they cool. Thank you for this recipe, David. It is so delicious, it has become our family holiday tradition already, we’ve made it two years in a row! This year I am thinking of making it and giving it out as gifts as well. This sounds dangerously addicting. Butter + maple is a never-fail combination… combined with crunchy nuts and pretzels, mmm. David! This looks absolutely DIVINE! Thank you for sharing!!!! This is a fabulous snack and I’ve made it many times. In the US, Trader Joe’s sells a peanut butter filled pretzel nubbin that I’ve used in lieu of the regular pretzels and they definitely add a little something-something! I bet this would be good with toasted chick peas too. I love sweet and spicy combinations. Adds so much depth. Note that this recipe uses raw nuts. So if you want to use already toasted ones, you can just warm them before adding them to the butter & spices, then toast them for the last part, as indicated, with the pretzels. The glazing (and with maple yet..mmm, how perfect) was exactly what I was missing last year when I made a snack mix that wasn’t baked. I had added some shortbread cubes (made with brown sugar that I had diced into 1/2″ pieces and baked) to the mix trying to steer away from the M&M’s that are usually part of the sweet/salty grab and go snack. It was a nice combo, but the glazing would have made it perfect. Thanks, David! gosh this stuff is so addicting! These sound wonderful! Adding the chili powder reminds me of one of my favorite cookies that the Liberty Bar in San Antonio brings to our table during Sunday brunch — their mexican chocolate icebox cookie. They are like little chocolate cakes! The recipe is on the Saveur website and it was on their 100 list a few years ago. However Saveur’s recipe is a little different from the one that the Liberty Bar owner gave me a few years ago. His had 1c of flour and no black pepper, just the cayenne. Also Saveur’s has slightly more sugar and cocoa. I will be making this “snack mix” for the holidays. This will be the first time since we purchased our house 24 years ago that we will be home for Christmas, so we are all very excited and I’m preparing foods to have on hand for friends that will be stopping by. This recipe sounds perfect. I’ll also be making a Buche de Noel for that Christmas Eve dinner, our first. Can’t wait! Ever tried it with smoked paprika ? I’ll sure do… and let you know. And now that I’m leaving a comment for the first time, thanks for all the recipes I gathered here overtime. mryna: I’ve made it with pimente d’Espelette, a dried pepper powder from the Basque region, and have used ancho chile powder. But no smoked paprika, which would be terrific, I’d imagine! I couldn’t wait to make these–I am getting bored with my own gifts repertoire. Addicting! Hope they make it into bags to give away. But so quick, I guess I can just keep making them….Thank you! Thank you! I’ve never been a fan of the ubiquitous chex mix, but my husband loves the stuff. This should be a fantastic (and much healthier) compromise! I’m not exactly sure what happen but none of the nuts retain the glaze, only the pretzels. Could over roasting do this? The nuts seem almost burned. The smoked paprika I like is Pimenton de la Vera, from the Extremadura region of Spain. It has its own appelation controlee. I use the “dulce” kind, which is sweetly smoky but not hot. I suspect there is a hot kind as well. Fabulous! Cant’ wait to try this! This sounds sooo good! I love snacks with sweet, salty and a bit of heat. The first post of yours that I read was about Chex Mix! I love your writing and photography! Thanks for the recipe. Will be making it for the holidays and will share it with my class on Monday. We are doing an activity with food blogs in the computer lab! This sounds great! Butter and maple, yum! Sounds like they would be good to divide up and pack in small bags for being out and about. I’m excited to try this… I’ve been making your Spiced Pecans recipe from The Perfect Scoop, and after making them for a Thanksgiving snack (ended up incorporating them into the salad, stuffing, and pumpkin bourbon mascarpone ice cream), we can’t go without a batch of spiced nuts in the house. We use a New Mexico green chile powder which gives them a nice heat… and love the salt… Looking forward to this recipe as well! Hi David, I just made the granola. Its fabulous, thank you for sharing!! 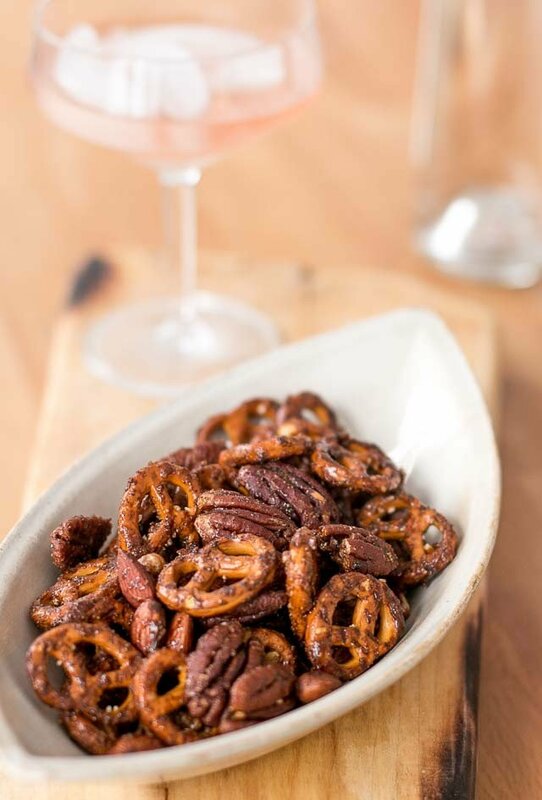 Why does this recipe say at the end, separate the nuts from the pretzels after cooling? I love your blog! Your photos add such “flavor” to your commentaries and recipes. When I was reading your book, I had mixed feelings about this recipe. Cinnamon with red pepper, all in one recipe! But reading the comments and seeing that everyone liked it, I see that it is worth trying. Giving them as mini-presents is a good idea, by the way. Can honey be used instead of maple syrup (don’t have it in Serbia :))? Dragana: I haven’t tried it but I’m sure it’ll work fine. If you give it a go, let us know how it works. Nai: One of the reasons I like pecans is that the glaze gets stuck in the cracks. Walnuts do the same thing. But since not everyone has access to the same kinds of nuts as I do, I’ve made it with various kinds. Try a non-smooth nut~if you haven’t. Not at my house! It will be lucky to see morning. Thanks so much! I made this last night for a Christmas party, and it was a hit! but no big deal! it just gives me an excuse to make an new batch – but i’ll be tripling or quadrupling the quantity so it lasts a bit longer! Just a couple of days ago I got this recipe out to check what I needed. The past two years I’ve made this it’s been loved by all who have come in contact with it. I used smoked paprika in place of some of the red pepper powder and I can confirm it is fabulous! This, and your nectarine and cherry compote (it’s summer now where I live) have become staples in our house. Thanks. David can’t wait to try your recipe. I did a variation once using Old Bay Seafood Seasoning someone brought over for me here to Paris, instead of chili powder, and it worked very well. Fantastic sweet/salty “aperitif” – Thank you! I’ll be taking this one away with me to my mum’s. It’s what Christmas is all about, stuffing your face with turkey and snacks like this. Ohhh yayyy!! Snack mix is practically a love language in our family! This one is getting printed off and thrown into the Christmas gathering rotation tout de suite! MMMMM. I make maple glazed pecans all the time and we love them on salads, in oatmeal, as is. These sound equally as delicious. This mix sounds perfect! I wanted to make a snack mix, but one without cereal pieces. :-( Love this … I have all the ingredients, even gluten-free pretzels. I’ll make this mix tomorrow for our celiac/gluten intolerance support group meeting. I saw this recipe this past weekend just in time to make and take to a party. So. Addictive. I actually ended up using only half the amount of salt due to personal taste…love the sweet and salty combo. I am so glad I had people to share this with or else the husband and I would have eaten the whole double batch ourselves….great recipe!! Thanks for sharing! Angela: I haven’t tried it, since the nuts and the glaze need stirring the paper might be difficult to manage, but it should work fine. gfe: That’s a great idea. I didn’t realize there were gluten-free pretzels. Sounds good! These sound delicious. I’ve done a similar recipe, but with added maple-glazed bacon, so I didn’t need the butter. However, I am now living with a vegan. Any suggestions for substituting the butter? Would olive oil work, or should I try something solid at room temperature, like EV Coconut oil? I would try something solid at room temperature. Coconut oil would likely work fine; if you try it, let me know how it works out. I just made these and I’m sorely disappointed—they didn’t turn out at all like yours. They got slightly burnt (I didn’t even bake them for a full 12 minutes and I stirred them every three), and the sugar-mixture didn’t glaze—it speckled. The sugar never dissolved properly. Maybe I should double (triple?) the butter? Also, have you ever tried using cayenne pepper in place of the chili powder? Would 1/4 teaspoon cayenne be sufficient? I’m not totally distraught; I’m still willing (and wanting) to try it again. I’ll have to give this a try … my family is big on snack mixes. I made a nutless, updated version of Chex Mix for my daughter’s birthday last month to rave reviews. I quadruple your recipe, David, and give it away as treats in pretty little bags. Well, I give away what’s LEFT after I’ve nibbled away at it for the evening. Anyway, I ran out of maple syrup the other night and it was just too cold to go out to get more (-58 C or -73 F here at the airport just outside of Edmonton, Alberta. Seriously). So, I substituted …Aunt Jemima’s pancake syrup! Not bad, actually. The final product is stickier and shinier than the maple syrup recipe but delicious all the same. Thanks for sharing this gem of a snack with us. David, I have made this numerous times– for parties, hiking, appetizers, and any other event or occasion I think is fitting. I always receive lots of praise and people who ask for the recipe. Thanks for this and the many more recipes that you share with us all! Can’t wait to try this. I’ll add a good dash of smoked paprika. help! i do not have baking sheet. will parchment paper work? or can i put the mixture onto the cookie sheet without any paper? any recommendations will be appreciated. thank you. hello david! i’ve been following your blog over the years and never left a comment until now but I wanted to share this story. i’ve been on a domestic kick lately and making lots of recipes off of food bloggers and last night, i made this holiday snack mix minus the pretzels. it came out beautifully and my partner ate a couple bites, swooned, and then turned to me and said, “this is a david lebovitz recipe, isn’t it.” he doesn’t even really know much about food blogs but he can tell which ones are your recipes just by taste. he says they taste the best. thanks for the great recipes. Just made up a batch for holiday gifts. Yum! I didn’t have any chile powder in the house so used some cayenne and sweet paprika (should have read these comments first and tried smoked). Some of my nuts were lightly roasted (no salt) as I couldn’t find non-roasted cashews and couldn’t bear to leave them out. And….I also forgot and put the fleur de sel in too early, but fyi, it’s still terrific – even with pre-roasted nuts and melted salt! Delicious! In response to some previous questions, I used smoked paprika and parchment paper, and both worked great (no sticking at all on the parchment). Thanks! I made this yesterday and my mum, bf and I ate it all within the evening. It is delicious! Copied the recipe for my mum to take home. Thank you so much for yet another wonderful dish. Merry Christmas! I’ve made two double batches of this in the past week: one to pack in bags to give away with some cashew brittle and peach sauce; and one to bring to my sister’s party on Christmas Day. Forgot to bring it (I didn’t go empty-handed, just left this sack behind). My family is SO sorry to have to eat it themselves…. Thanks, David! I made this with pecans only and IT IS SOOO GOOD!! Definitely the best nuts I have ever put in my mouth (hehe!). I subbed molasses for the maple syrup (cause I’m from Texas, ya’ll) and used cayenne and smoked paprika for the spicy. Awesome! I started reading your blog this year and this is the first thing I’ve tried to make, had a whole houseful of family over the holidays. I doubled the recipe. I used hazelnuts, pecans, cashews, almonds, and pretzels, and the snack mix was absolutely delicious. The combination of the sweet and spicy is wonderful. We ate up both batches over three days, thank you very much for including the recipe again! I used parchment paper and had no problems with it. Positively delicious!! Just made this… it was was absolutely delicious! I made it in advance, and had to hide it from myself in order to keep from eating it all before guests arive! Ditto on the parchment paper, Maureen. Used a cocoa/dhile blend for the hot note, and it worked really well. This is a keeper. But a week in the sealed container? You cannot be SERIOUS, David!